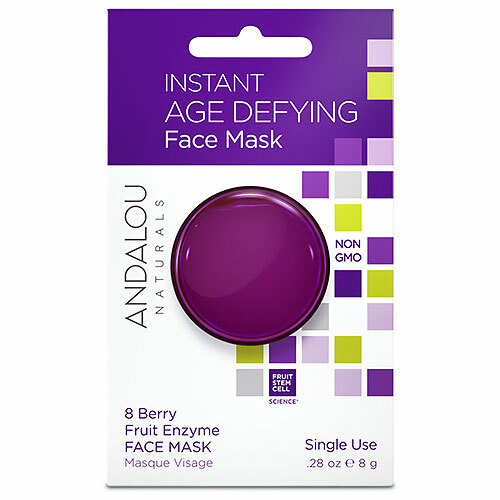 8 Berry Fruit Enzyme Face Mask Fruit stem cell complex and resveratrol CoQ10 instantly refresh as fruit juice enzymes gently exfoliate dull, dry surface cells to reveal skin’s natural glow and a rejuvenated complexion. Aloe Barbadensis Leaf Juice*, Vaccinium Macrocarpon (Cranberry) Fruit Juice*, Purified Water (Aqua), Vegetable Glycerin, Hydroxypropyl Starch Phosphate, Tocopherol, Fruit Stem Cells (Malus Domestica, Solar Vitis) and BioActive 8 Berry Complex*, Saccharum Officinarum (Sugar Cane) Extract*, Lecithin, Algae Extract, Manuka Honey, Resveratrol, Ubiquinone (CoQ10), Papain, Helianthus Annuus (Sunflower) Seed Oil*, Limnanthes Alba (Meadowfoam) Seed Oil*, Pyrus Malus (Apple) Fruit Extract*, Xanthan Gum, Citrus Medica Limonum (Lemon) Fruit Extract*, Camellia Sinensis (White Tea) Leaf Extract*+, Hibiscus Sabdariffa Flower Extract*+, Aspalathus Linearis (Rooibos) Extract*+, Phenethyl Alcohol, Ethylhexylglycerin, Raspberry Isolates, Vanilla Isolates, Citrus Aurantium Dulcis (Orange) Peel Oil*. Below are reviews of Andalou Instant Age Defying Face Mask Pod - 8g by bodykind customers. If you have tried this product we'd love to hear what you think so please leave a review.